Kyrie and his sister Asia Irvin. 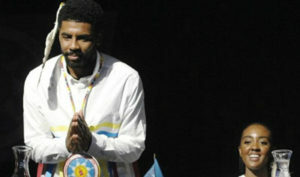 It was such a memorable moment for Boston Celtics star Kyrie Irving when he was honored by his mother’s Sioux Tribe. The basketball star was presented with sacred glasses, traditional quilts and adorned with eagle feathers. Besides the presents, which boast of great significance in the tribe, Irving also received a Lakota name that means “Little Mountain,” all happening at the event in which he was welcomed officially to his mother’s Standing Rock Sioux tribe on Thursday. The All-Star and his model sister Asia Irving had visited the tribe’s reservation located on the border of North and South Dakota, where there was a daylong celebration in recognition of the tribe’s incessant fight against the Dakota Access oil pipeline. Kyrie got the name “Hela,” pronounced as “Hay-law,” meaning “Little Mountain.” On the other hand, his sister Asia got the name “Tatanka Winyan,” pronounced as “tuh-TONG’-kuh WEE’-yun” meaning “Buffalo Woman.” Both names are associated with the siblings’ White Mountain family. Their mother, Elizabeth Ann Larson, was a member of Standing Rock Irving Sioux tribe. During her childhood, Larson lived in the reservation until she was later adopted at a young age. Both the Irving’s late grandmother and great-grandparents have links with the reservation, showing clearly why they have great reverence for the tribe. Many people in attendance, including Char White Mountain, consider the Irvings as part of their family. Jewel Felix, who was also at the event and who considers Kylie Irving her nephew, said she got emotional at the news that the basketball superstar was gracing the occasion. Interestingly, the feeling was mutual.